I had a bag of spinach I needed to use up when I saw this recipe from Fantastical Sharing of Recipes. I've also had this recipe from Simply Recipes on my "to make" list for way too long! So what to do? Combine the two, of course! 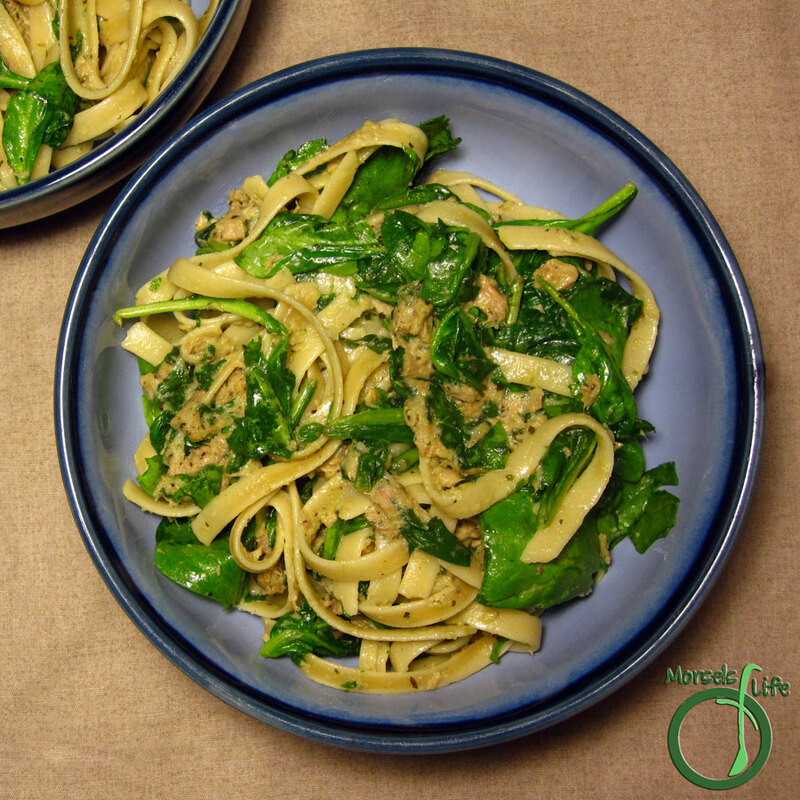 I know this Fettuccine Alfredo is a simplified version, but with the addition of spinach and tuna it works perfectly. I never knew Fettuccine Alfredo was so quick and easy. It's a recipe I've always put off making since I thought it'd be too complicated and time consuming. I should have known better after looking at a recipe, but sometimes preconceptions stay strong. For this Spinach Tuna Fettuccine Alfredo, you just mix in some tuna and Italian Dressing Seasoning in with the butter and pasta. Then, when it's mostly cooked, throw in the spinach, and you're ready to serve! What are some recipe preconceptions you've held? Cook noodles following package instructions. Meanwhile, mix Italian Dressing Seasoning with drained tuna. Melt butter in a pan and add tuna mixture. Mix in cooked pasta, cheese, and spinach, continuing to cook until spinach wilted. This looks delicious. I've got most of those items in my pantry too!Thanks for sharing on the Waste Less Wednesday Blog Hop! A new version of tuna casserole! I love it! Thanks for sharing on the What’s for Dinner link up and don’t forget to leave a comment at the party – Next week’s features that also leave a comment get pinned, yummed and tweeted! I love all these ingredients CJ but have never made this dish. Seems I need to rectify this! Thank you for sharing your wonderful post at #OverTheMoon. I look forward to what you will share next week! Do something special. Give yourself a standing ovation today! We hope you’ll come back again next Sunday when we open our doors at 6:00 PM EST. “Like" someone in person today!